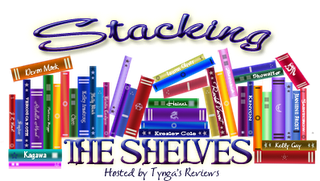 Stacking the Shelves is a weekly meme created by Tynga's Reviews to showcase books that we got - be it for review, by trade, because we bought them, whatever. Those can be printed or ebooks. As announced in the title, my haul since Sunday has been huge! Part of that is because I had ordered and preordered quite a bunch of books (I was lured in by bargains and vouchers and the like) and part is because I have an amazing friend who gave me a ton of books she had gotten from a relative who moved, but that she didn't want for herself (it was like 3 huge boxes, she kept some, but were also a load that will be given away to a used book shop). I've wanted all of those for forever! Unspoken finally arrived today (I had hoped I'd get it be Tuesday). I can't read either of them now because of the sequels challenge, but I finished Masque on Thursday night and the review will probably go up on Sunday. 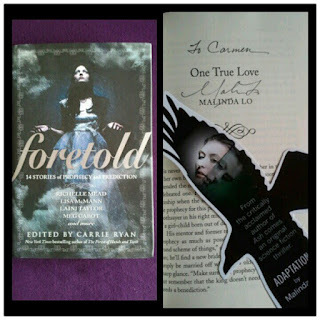 And now... *drumroll* the very pretty signed Foretold anthology I won in a giveaway from Malinda Lo! It's so pretty *hugs* I have few signed books so this is precious to me! 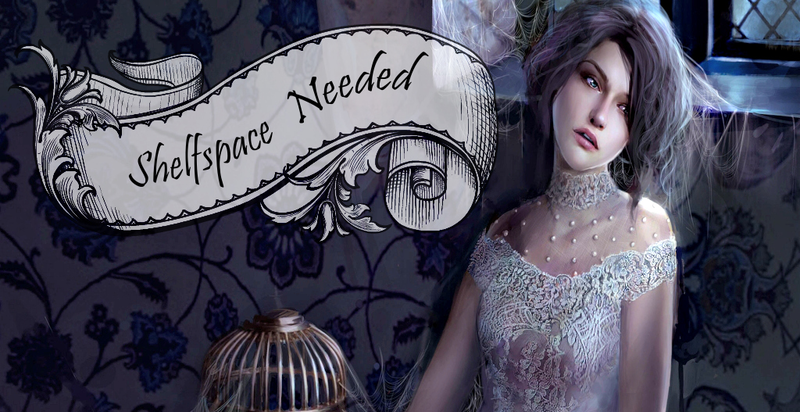 Click the pic to get to Goodreads. I've only seen the first two seasons of the Dexter TV show bu I loved them! So I'm curious about those first four books. I've read a short story of Carrie Ryan's that is connected to the novel but not the novel itself, so yay! 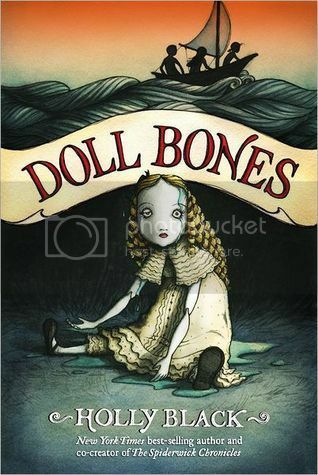 And Neil Gaiman is one of my big loves when it comes to books. So yay again! That are a lot of books! I'm so jealous about the books you bought! Three books I can't wait to read! But I try to buy less books now, because my TBR pile has to get smaller! A wonderful haul! I received Carnival of Souls this week as well & can't wait to get started on it. Wow a lot of books I really want to read the masque of the red death it sounds awesome. Happy reading! I'm really looking forward to reading Unspoken! I've never read anything by SRB but it sounds awesome so I MUST get it. Interesting. A very diverse selection of books this week. I love Gaiman (I'm reading American Gods at the moment). Like you, I only saw the first two seasons of Dexter, and I think it's high time I read the books. Yay for your book-sharing friend :)I'm following your blog now. Great haul! Gaiman is one of my faves too, and I'll read anything with his name on it! And congrats on winning an autographed copy of Foretold! Very cool! And the Dexter books are really good too. Happy reading! Wow that's awesome that you got a signed copy of Foretold!! I hope you enjoy it, I've been meaning to pick it up for awhile now!! So many good books, happy reading. Your bought books are awesome! Masque is so so good! Carnival of souls I have been waiting for for ages! Happy Reading! WOW awesome haul! I love the Malindo Lo book mark for Adaptation, I just finished that one earlier this week and while I wasn't a huge fan of it the bookmark is very cool and very fitting. You got so many goodies, I hope you enjoy them all! I LOVE the covers for the Dexter books. I have all of the books to date. I started to read the first one, but then got bored because it's literally the first season all over again. I do plan on picking it up again. I'm in LOVE the series.